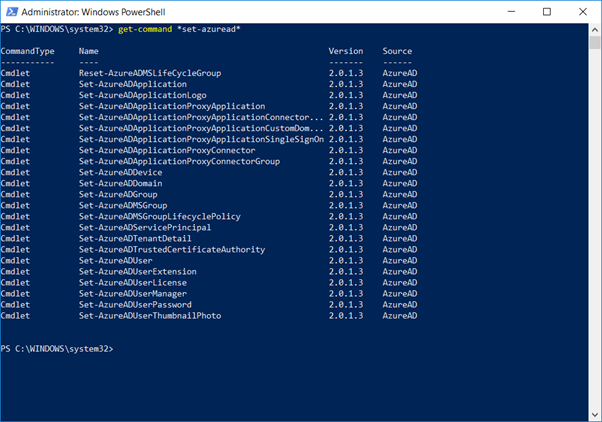 Now with Microsoft moving from the old MSOL to AzureAD PowerShell commands (see my blogpost on Azure Active Directory PowerShell v2), you get new features but (unfortunately) things are starting to disappear as well. In the past you could use Azure AD PowerShell to enable or disable directory synchronization using the Set-MsolDirSyncEnabled cmdlet. During a recent lab deployment, I found out that this cmdlet is no longer available. In fact, not a single Msol cmdlet is available anymore, try Get-Command *msol* and nothing is returned. 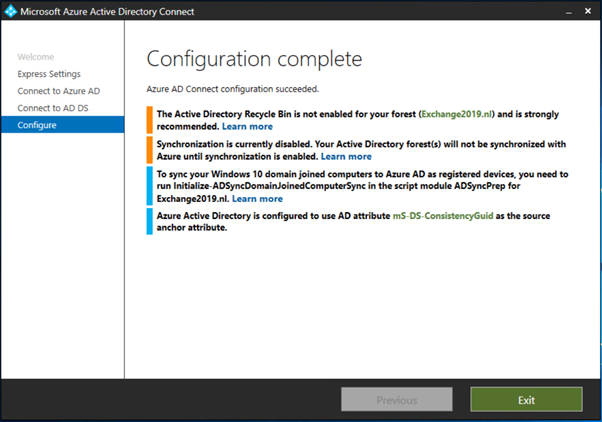 To get more information regarding Azure AD you can use Get-Command *Set-AzureAD*. This reveals enough information, but nothing that points to directory synchronization. So, let’s give it a try…. 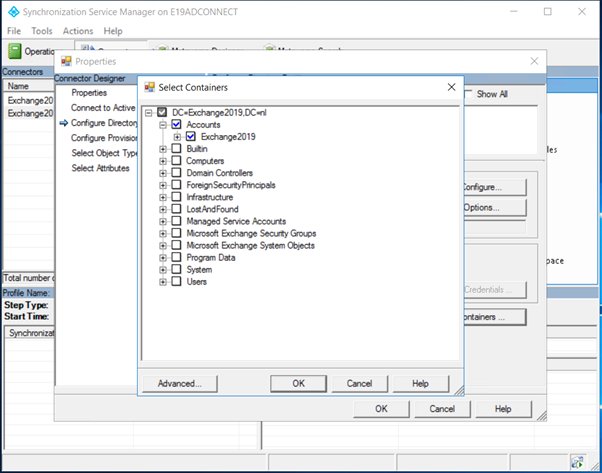 One remark: I unchecked the Start the synchronization process when configuration completes option, and checked the Exchange hybrid deployment checkbox. The reason I unchecked the synchronization process is that I do not want to synchronize all objects from my on-premises Active Directory to Azure Active Directory, but I only want to synchronize objects from the OU=Accounts container in my Active Directory domain. When the configuration is complete you can click the Exit button and you’re good. Please note that at this point no synchronization has taken place yet. 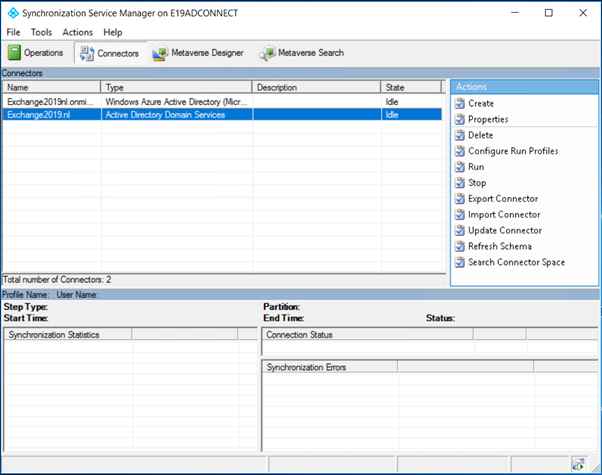 To make a selection based on Organizational Unit for synchronization you can start the Synchronization Service Manager (miisclient.exe) which can be found in the C:\Program Files\Microsoft Azure AD Sync\UIShell directory. This will trigger the initial synchronization to Azure Active Directory, but won’t do any subsequent sychronizations. Use the Set-ADSyncScheduler -SyncCycleEnabled $true command to run periodic synchronizations. So, in short, previously you had to enable directory synchronization manually using the Set-MsolDirSyncEnabled command (or using the wizard in Office 365), but this is no longer the case. 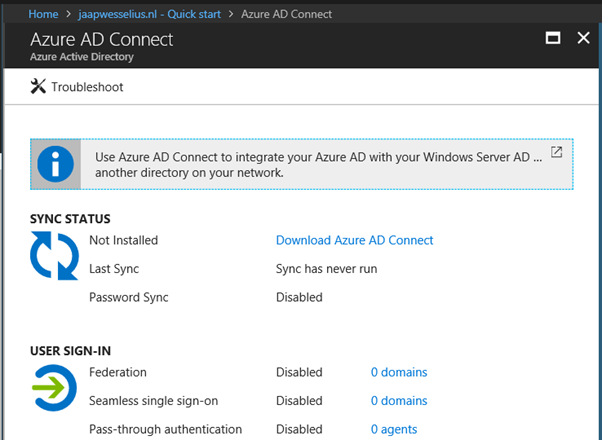 When running Azure AD Connect, directory synchronization in your tenant will automatically be enabled. Every now and then I get a question regarding creation of Room- or Shared Mailboxes in Office 365 when Exchange Hybrid is in place.There are multiple solutions available, but at the same time there are some restrictions as well. In this blog post I’ll discuss Room Mailboxes, Equipment Mailboxes and Shared Mailboxes. To create a room Mailbox in your hybrid environment create a user account for this room mailbox first. 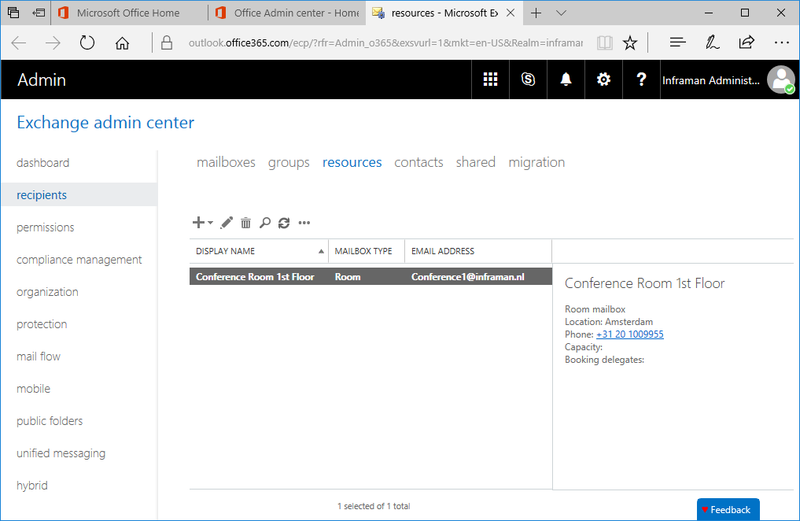 In this example I’m going to create a Room Mailbox called ‘conference room 1st floor’ and have it created directly in Office 365 (for your information, I’ve tested this with Exchange 2010 hybrid as well as Exchange 2016 hybrid). To create the Mailbox in Exchange Online, you can use the Enable-RemoteMailbox cmdlet in Exchange PowerShell. This will mail-enable the account in your on-premises environment and will automatically create a mailbox in Exchange Online the next time Azure AD Connect runs. For the Enable-RemoteMailbox cmdlet you need to use the -RemoteRoutingAddress (which should point to the Mailbox in Exchange Online) and for a Room Mailbox you have to use the -Room option. If you want to create a Shared Mailbox you can use the -Shared option, the result will be the same. When Azure AD Connect has run, the account has been provisioned in Azure AD and the Room Mailbox has been created. 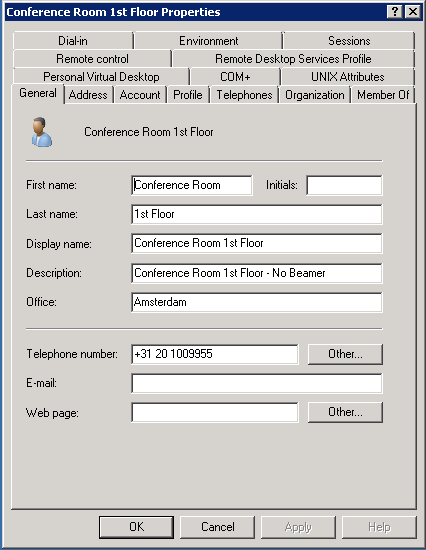 It is visible in Exchange Online EAC and permissions can be granted to other users can manage the Room Mailbox. Createing Shared Mailboxes is a bit problematic, after all these years there’s still no option like -Shared when using the Enable-RemoteMailbox cmdlet in Exchange PowerShell so we have to figure out another way to create a Shared Mailbox in Exchange Online when using Azure AD Connect and a Hybrid environment. 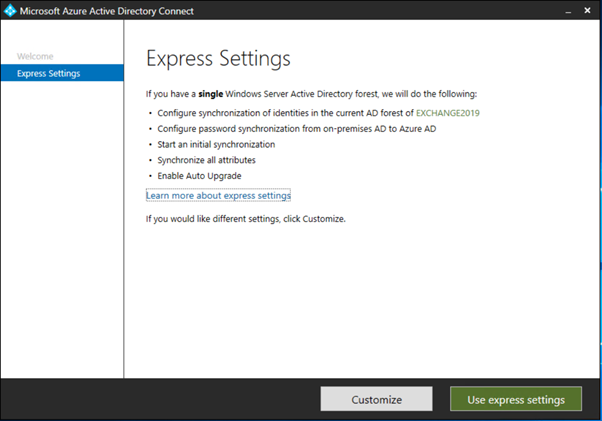 There are a lot of articles on the Internet on how to create a hybrid environment, where Exchange 2016 is connected to Office 365. Now that’s fine, but when you’re running Exchange 2016 you most like are NOT going to move to Office 365 anytime soon I guess. If you are running Exchange 2010 chances are that you will move to Office 365 (soon), but there aren’t that much articles about moving from Exchange 2010 to Office 365. And a lot of the articles available don’t have the right approach I’m afraid, and will result in you (the customer) having to pay way too much money to your system integrator. Our organization is called Inframan and they have their own on-premises Exchange 2010 environment which they have been running for 5 years now without too much issues. There are internal Outlook clients using Outlook 2010 and higher, and there are external clients using Outlook Anywhere. There are also mobile clients using ActiveSync to connect to their Mailboxes. Of course, there is Outlook Web Access, but POP3 and IMAP4 are not used. Figure 1. Overview of the Inframan Exchange 2010 environment. The question in my previous blog post was “Can we decommission our Exchange servers after moving to Office 365?” and the blunt answer was “No, you cannot decommission your last Exchange server on-premises”. In this previous blog post I showed you what happens if you synchronize a user to Azure Active Directory from your on-premises Active Directory, and how to create a Mailbox in Exchange Online with a proper primary Email address. At the same time, it was only possible to set only one Email address, and there’s no possibility to add multiple Email addresses, nor is it possible to change any other Exchange related setting. 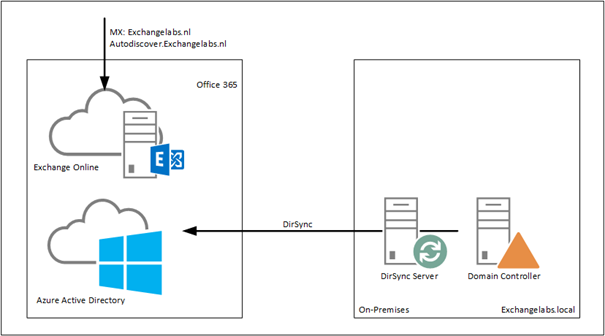 I get a lot of questions regarding Office 365, Directory Synchronization from an on-premises Active Directory and decommissioning Exchange servers on-premises. A lot of customers want an Active Directory on-premises, they want Mailboxes in Office 365 and they don’t want an Exchange server on-premises anymore. It is an easy question with an easy answer, and the answer is “No, you cannot decommission your last Exchange server on-premises”. Let me explain why. 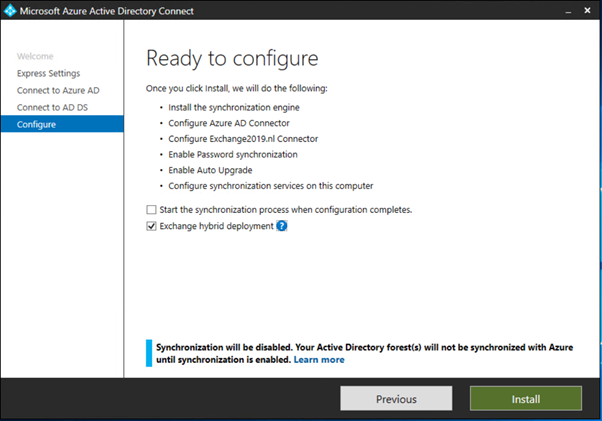 With Directory Synchronization (through Azure AD Connect) in place we’re talking about Synced Identities or Federated Identities. Important to note is that the Source of Authority, which means where the identities are managed, is the on-premises Active Directory. Account are created and managed on-premises and not in the cloud. This is also true for properties of the accounts. Suppose we have the following situation. 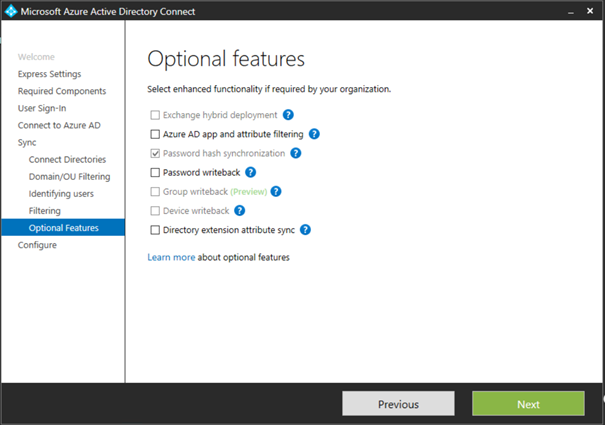 There’s an Active Directory environment, no Exchange servers on-premises and there’s an AADConnect server for replication purposes to Azure Active Directory as shown in the following picture. Figure 1. Azure AD Connect is synchronizing user accounts to Office 365. The internal domain is Exchangelabs.local, the external domain Exchangelabs.nl is only verified in Office 365 and set as the default domain. In the on-premises Active Directory there’s an OU=Accounts where objects are in various OU’s like OU=Groups, OU=Users, OU=Contacts etc. Figure 2. 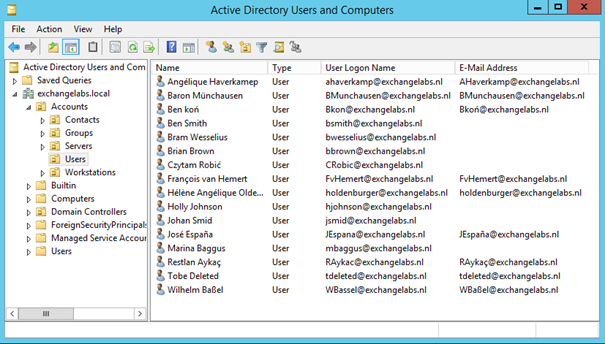 User accounts in Active Directory Users and Computers. Please note the different settings in the E-mail Address column. The only option that’s selected is the Password hash synchronization. The Organizational Unit OU=Accounts as mentioned before is the only OU that’s selected for object replication, so after finishing the setup application and the initial synchronization the user account will appear in the Microsoft Online Portal. When the Office 365 (E3) licenses are assigned to the replicated user accounts, one strange thing is visible. The user account is exactly as expected, i.e. bwesselius@exchangelabs.nl, but the primary SMTP address does not reflect this, and is actually based on the tenant name, i.e. 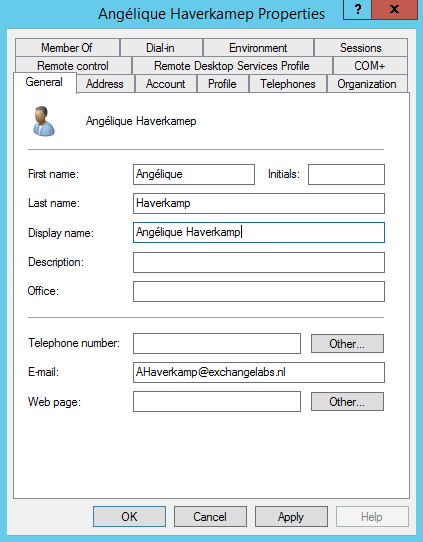 bwesselius@exchangelabsnl.onmicrosoft.com as shown in the following screenshot. Figure 4. User’s email address is set incorrectly. The tenant email address is set as primary SMTP address. The Set as Primary button is greyed out, so it’s not possible to change the email address. 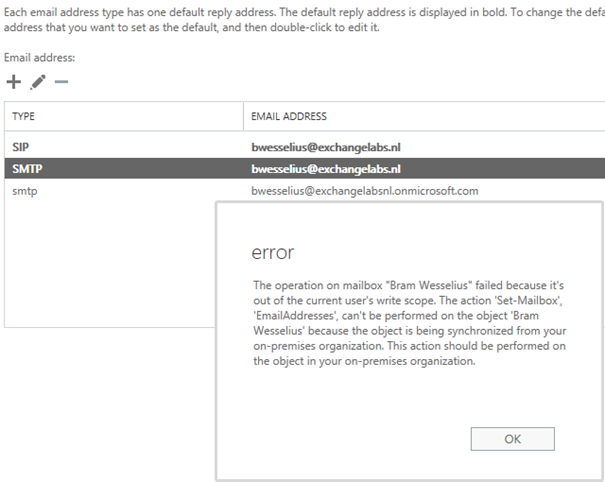 The operation on mailbox “Bram Wesselius” failed because it’s out of the current user’s write scope. The action ‘Set-Mailbox’, ‘EmailAddresses’, can’t be performed on the object ‘Bram Wesselius’ because the object is being synchronized from your on-premises organization. This action should be performed on the object in your on-premises organization. Figure 6. An error message about ‘write scope’ is shown when the user’s Email address is changed. Now it gets interesting. Have a closer look at Figure 2. You will see that user BWesselius does not have an email address set in Active Directory, but user Ahaverkamp does have an email address. This is not an Exchange email address (since Exchange is not installed on-premises, Active Directory doesn’t have the Exchange schema changes applied, it really is a green-field Active Directory) but the email address is set in Active Directory Users and Computers. Figure 7. The user’s Email address is set in Active Directory Users and Computers. When the Email address is set using Active Directory Users and Computers it is synchronized correctly to Office 365 and used in Exchange Online as the user’s primary Email address. So, now we know how to set the primary Email address when the user is provisioned in the on-premises Active Directory. Despite the fact the user now has the correct primary Email address, it is still not possible to change the user’s Email address in the Office 365 portal or Exchange (online) Admin Center. This behavior is caused by the fact that the account in this scenario is a Synced Account. The source of authority is the on-premises Active Directory, and this is where all changes need to be made. Once changed the new settings are synchronized to Office 365. 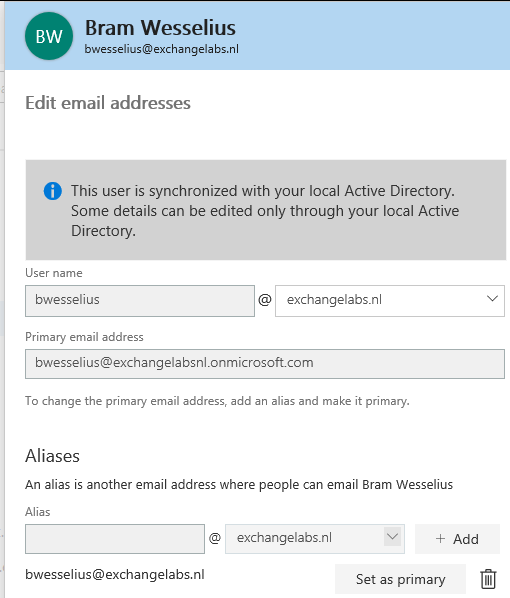 So, to change the primary Email address for user BWesselius it’s a matter of adding the Email address to the mail property in Active Directory users and computers and wait for synchronization to happen (or force directory synchronization). If you want to change an Email address, for example for user AHaverkamp you can just change the mail property of the user in Active Directory Users and Computers. So, now we know how to create a user in the on-premises Active Directory and have the Exchange Online primary Email address set correctly. 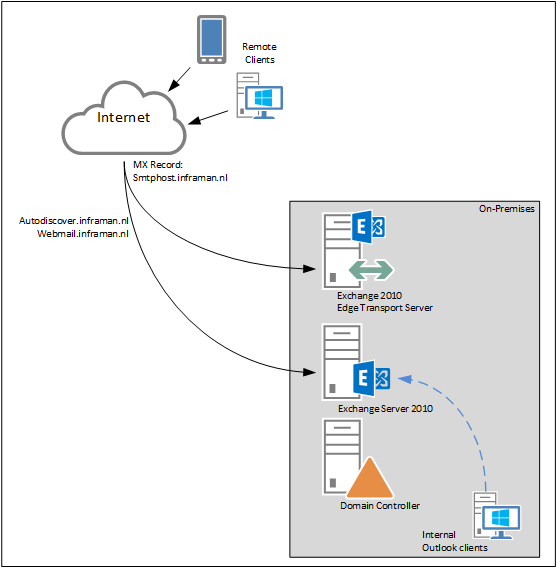 In my next blog I’ll talk more about an on-premises Exchange server.